Hampton residents talk diversity at a state listening session Wednesday night. At a state listening session on diversity last night, Hampton residents said communities like theirs need more resources to confront issues of prejudice. The event was held amid ongoing controversy over allegations of racist bullying in a local elementary school. Governor Chris Sununu’s council on diversity and inclusion has now held 15 of these listening sessions around the state. They’re collecting recommendations for a report due later this year on how New Hampshire can become more welcoming to people of all identities. 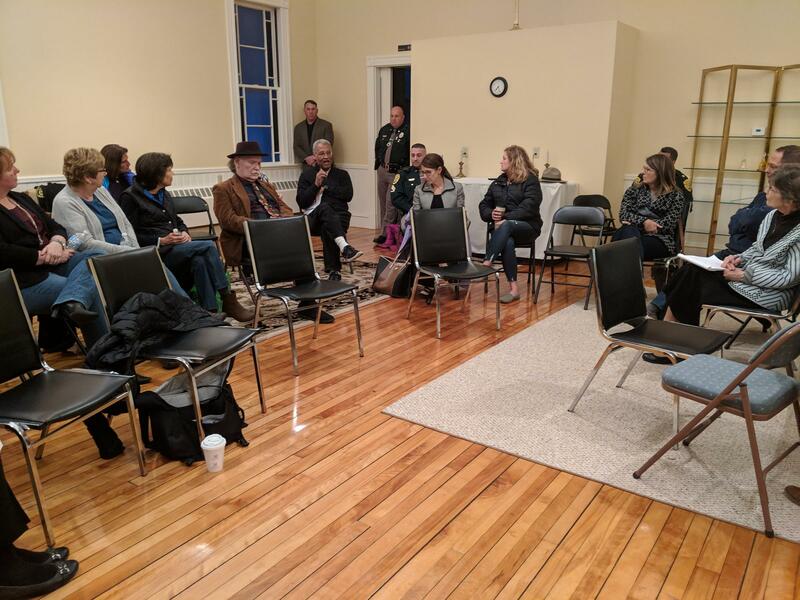 People at the Hampton event said teachers and other community leaders need more structured help – and funding – to learn how to talk with young people and other adults about issues of race, gender, religion, disability and more. Others said more widespread conversations like the one Wednesday night would also help create change. Meg O’Connor is an attorney from Hampton. She said schools and other institutions should have a framework of procedures and personnel for when complaints come up. “So what are the proactive steps that we’re taking? And it takes a person that’s going to be willing to unpeel those layers, can sit in the discomfort, and maybe just close our mouths and listen,” O’Connor said. John Cochrane said he’s seen firsthand ways in which the state’s public education system could do that. Cochrane, who’s white, says his daughter, a third-grader who’s black, was bullied about her race by classmates. And he says school administrators didn’t do enough to respond. “I think the biggest gap is there needs to be an avenue for parents to have somebody that they can report to that’s a third party, that’s not in the chain of command,” he says. The Cochranes have transferred their daughter to a private school, and want the Hampton school district to cover their tuition costs. The school board is due to rule on that request soon. After holding 14 listening sessions across New Hampshire, Governor Sununu's Advisory Council on Diversity and Inclusion has released a preliminary list of recommendations aimed at increasing equity in the state. Among the six recommendations (you can read them all here) is a call to increase money for diversity training in schools. Nashua is the most diverse city in New Hampshire, with the state’s largest population of foreign-born residents. Today on Word of Mouth, we’re exploring how immigrants decide to build a life in Nashua… and what that has meant for them and for the city. Then, we’re going way back in time to look at how Magna Carta shaped the American democratic project. Dover residents can delve into their experiences with racism and stereotypes at a forum at the city's high school tonight.